Continuing with the outcome of first workshop  for “Women of Minya Day by Day” that took place from September 23-25; Nevine Fahem, the project's organizer, wrote that approximately 16 posts had been uploaded as a first harvest of this training. 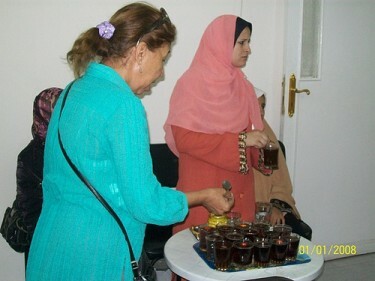 All of the posts focuses on different issues in the village of Dawadeyya, and all are addressing women equality and empowerment in rural areas. She also noted that the training provided a half-day session on digital photography, where the women practiced by photographing one another. The next visit we take place in the village itself, where the women will take part in an intensive field training to help them to take photos in the village by themselves. 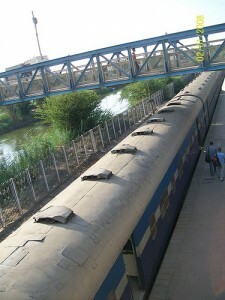 Picture for Menia`s train station from the project's Flickr account. One of the other stories mentioned is by “Mariam” , a 25 year-old who was widowed twice, and was remarried for a third time to a 65 year-old man. Mariam was the only girl to a very poor family. She had 4 brothers. She had to work in buying and selling grocery with the foundation of her mother’s retirement money, 80 pounds a month. When she was 15 she had a proposal from her cousin. She accepted, wishing for a better life. Soon enough, she had her fights with her husband and his mother though she did all that was required from her. Everyday she waked up from the dawn, cleaning, feeding and milking the cattle and making cheese. She did also all the house keeping to the extend that she had no time for herself. She started to ignore her husband’s needs. He couldn’t stand that and he committed suicide by burning himself. He shortly died after staying 2 days at the hospital. But the story doesn't end here, “Mariam” then returned back to her mother's house when she was 17. And in order to escape the bad conditions in the house, she accepted another marriage proposal wishing for a better life, when again her second husband died all of a sudden. She returned to her mother’s house again but this time they couldn’t stand her and started teasing her about her poverty and the death of her 2 husbands, telling her that she was the cause of this. Finally she got a proposal from an aged man, 65 years old. She was uneducated and she couldn’t wait for other better chances. 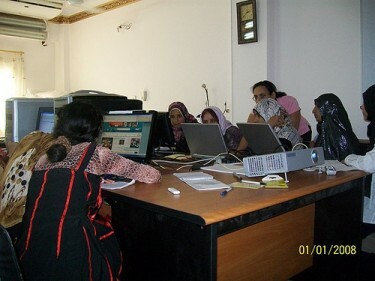 A picture for participants during a blogging session by Nevine Fahem. Another heartbreaking story is by “Nadia” , a young woman in a family of 8 – who suffered after her father died and left them without a pension. Many people were helping us during my father’s illness until his death. It was inevitable that my mother should work. She worked as bread maker and in collecting the crops but that wasn’t enough for feeding, dressing and educating 7 children . The villagers asked us to work in constrictions for 3 pounds a day including our food. […] We were working 12 hours a day, carrying contraction’s materials on our head which were basically cement, sand and white bricks, carrying them to the scaffold. They insulted us so much but we couldn’t do without that job. We had to bear all that so that we can live. My brothers weren’t able to continue their education. Three daughters didn’t go to school from the first place. They did the house keeping instead. Only one went for sometime to an illiteracy institution. It was only me that made it to some high school. “Heba”, another participant in the workshop, told her story [ar]  about giving birth to females. She got married when she was 14. Soon enough, she gave birth to 3 girls, when the doctor advised her not to give birth again – because it is dangerous for her health. Her mother-in-law started mistreating her in order to give birth again to a boy! She is asking what should she do to fulfill her husband's wish? and whether giving birth to a boy is only her responsibility? Tea break through out one of the workshops. I can’t deny that the right of health was the top issues that girls would like to write and photograph and take video shoots about. So next month we will dedicate more posts on the health states for women with video shoots with women them selves and doctors in the health unit, hospital and pharmacy. Also, we hope to provide a legal aid from other NGOs to the village’s women who in need to insure their housing and making interviews with lawyers and women. Also, we hope to meet more stick holders in the village to focus on women rights and link the village with decision makers. You can follow more updates from the project through their Twitter page , and YouTube channel .